1. Take the time to witness the dramatic display of colors amongst the foliage –bronze, brilliant orange, gold, crimson, and other autumn shades. 2. Celebrate the colors of the season. Get a sweater in warm pumpkin or burnt sienna; paint a wall of your house in a cool olive or mustard yellow; or get a few throw cushions in chocolate browns. 3. Go for a walk and take in the clean, crisp autumn air. Enjoy the sound of leaves crinkling and crackling underneath your shoes. 4. Have a photo-shoot among the falling leaves. 5. Collect golden autumn leaves and use them to decorate your dinner table, windowsills, or any other surface you choose. Also, make a bouquet of autumn leaves. 7. Decorate the mantle with a fall theme. 8. 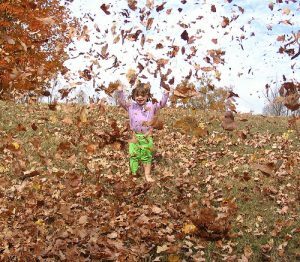 Rake a giant pile of leaves, take a few steps back, run, and jump in! End up lying on the ground, face up, watching the leaves fall from the trees, and the clear blue sky beyond. 9. Get a horn of plenty-a woven horned basket-and fill it with autumn produce such as apples, grapes, pears, potatoes, Indian corn, nuts, and wheat. 10. Start an impromptu football game. 11. Spend a Sunday afternoon doing nothing but watching football and eating chili. 12. Buy roasted chestnuts from a street vendor. 13. Find a foolproof recipe for a crock-pot meal or a hearty soup. 14. Listen to Vivaldi’s The Four Seasons – Fall. 15. Go on a hayride. Choose between horse and buggy or a truck-driven hayride. 16. Bake cookies shaped like autumn leaves. 17. Get a 1000-piece puzzle with an autumn motif to put together on a chilly night. 18. Attend a Fall Festival. 19. Make a Harvest Broom and hang it from your front door. You can also make a Fall Wreath like this one or like this one. 20. Get some nutmeg, cinnamon sticks, vanilla beans, and cloves, and make Fall potpourri. Add pine cones, twigs, and dried flowers. You can also get Yankee Candles in Autumn Wreath, Spiced Pumpkin, or Harvest. 21. Get a special mug for autumn. 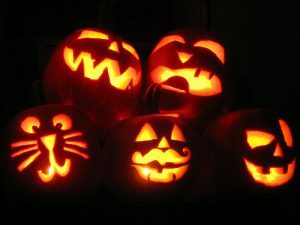 It can have brightly colored leaves on it, or a Halloween-theme, such as zombies or pumpkins. 23. Visit a pumpkin patch and choose several pumpkins to take home. 24. Make pumpkin cupcakes, or pumpkin pancakes. 26. Carve your own Jack-0-Lantern. 27. Go to your nearest apple orchard and look for the best apples to take home. 28. Bake an apple pie–with a flaky, light, delicious crust–from scratch. 29. Get a large tub of water, fill it with apples, gather a fun group of people, and go bobbing for apples. 31. Enjoy some apple cider. Get yourself a warm mug of cider and sit out on the porch or balcony when it’s cool out. 32. Visit a haunted house, or put together your own. 33. Dress up in Steampunk attire for Halloween (Victorian science fiction). 34. Organize a Spooky Pooch parade and dress your dog in a Halloween costume. 35. Decorate your home for Halloween. Make sure to include monsters, witches, ghosts, skeletons, spider webs, and black cats. 36. Put up a Halloween Tree and hang up ornaments shaped like Frankenstein, Dracula, skulls, and orange and black glass balls. 37. Create a Halloween Village filled with creepy, scary Halloween themed houses, figurines and accessories. 38. Organize a Halloween party. 39. Participate in a costume contest. 41. Watch “It’s the Great Pumpkin, Charlie Brown”. 43. Get a big bag of fresh Brach candy corn, and a big bag of mellowcreme pumpkins. 44. Be the house with the best Halloween candy on the block. 45. Make a scarecrow (here’s a good tutorial). 46. Read spooky stories like “The Legend of Sleepy Hollow” or “The Telltale Heart”. 47. Have a horror movie night marathon. 48. Have a marathon of “The Addam’s Family”. 49. Have a marathon of “The Munsters”. 50. Set an elegant harvest table of Thanksgiving. 51. Make a classic Thanksgiving meal: turkey with all the trimmings. 52. Go around the table and have each person give thanks for at least one blessing they’ve received this year. Better yet, create a Thankful Tree. 53. Take the wishbone from the turkey and make a wish. 55. Watch the Macy’s Thanksgiving Day parade on TV. 56. Spend “Black Friday” making homemade gifts for loved ones. What’s on your Fall/Autumn Bucket List? Please share in the comments. This entry was posted in Animal Conservation, Bucket Lists, Dreams, EARTH EXCHANGE, Global Earth Exchange, Hope, Hunting, Inspiration, Life Goals, Meigs County Tennessee, Mountain Creek Home, Nature, Outdoors, Ten Mile Tennessee, White Tailed Deer, Wildlife Conservation, Wishes, Wounded Nature and tagged Bucket List, Bucket List Ideas, Dreams, Fall, Halloween, Happiness, Happiness List, Hope, Hopes, Ideas, Inspiration, Life, Wishes. Bookmark the permalink.